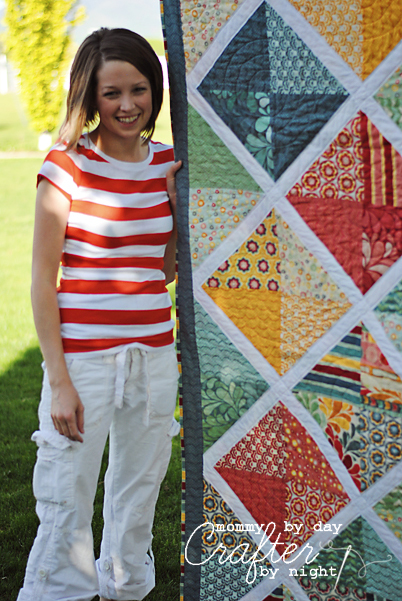 I used one Moda Layer Cake (which is 42- 10 inch squares that come pre-cut.) I love using layer cakes because it cuts down on all of the cutting you have to do! And then I used half of a Moda White jelly roll (which is 42 pre-cut strips that are 2 1/2 by 44 inches long) for the lattice criss-crosses. 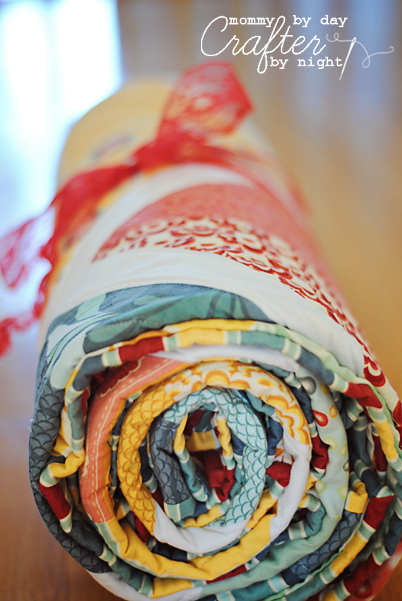 My favorite way to give quilts as a gift, is to fold it in half and half again (so it is 1/4 the width) and then roll it up into a neat little roll and tie it with cute ribbon. 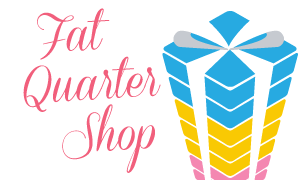 So I am not going to go into detail on how I made the entire quilt since we have the Quilt Along coming up soon (I will be announcing the supply list on May 25th- stay tuned)... 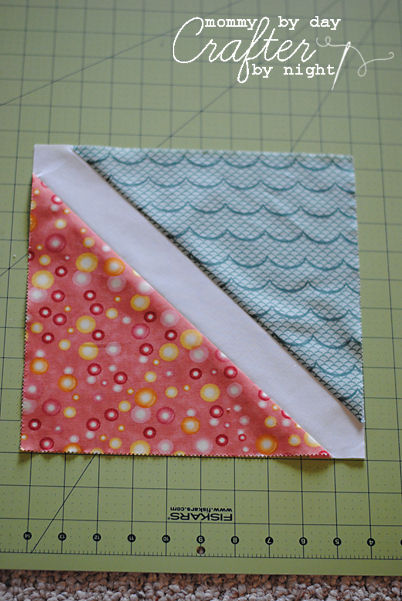 But I thought I would share how I pieced the top of the quilt in case anyone wanted to recreate it themselves. Now at this point, you can lay out your triangles and strips to make up your pattern to visualize where you want each fabric piece in relation to all of the others... for mine, I put the yellow fabrics together in a diamond, red in a diamond, blue in a diamond, etc. If you don't care about the fabric being in a specific order or layout and just want it to be random then you don't need to do this step. 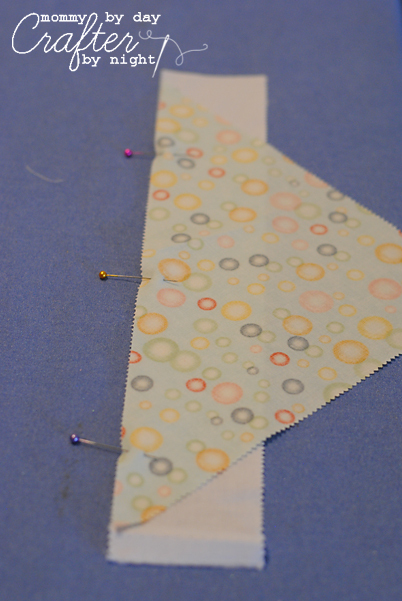 To piece each square, I took one of the triangles and pinned it in the middle of one 15 inch strip (there should be a little overhang on each side of the triangle) and stitched it, and then added another triangle to the other side of the strip and stitched it. Next use a straight edge and rotary cutter and square off the excess of the white strip so that the square is "square". Repeat with each of the triangles and strips until you have 42 squares total. When it is all laid out, it should look like this. 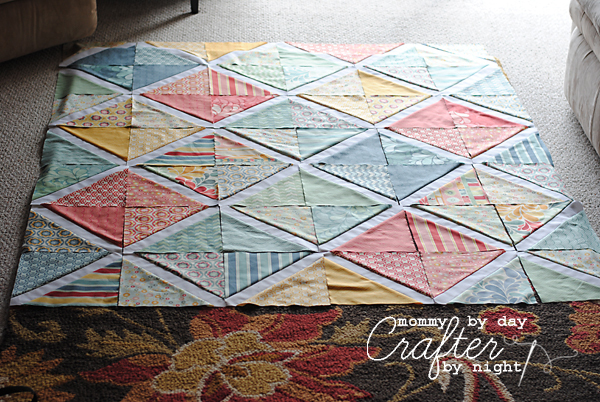 Now you just sew each of your squares together row by row until it is all pieced together. Then to set off the diamond/lattice pattern I added some small borders to finish it off. Pretty simple quilt to put together!! P.S.... I made a dumb bloggers mistake and forgot to measure this quilt before I gave it away to my mom in law... but it is just a lap sized quilt- nothing too huge! Stay tuned for the quilt I made for my mom for Mother's day!! Oh wow, that is so beautiful! I want that!! yes, agreed, i want that! i've been wanting to use that fabric for something, it is so gorgeous!! you did a wonderful job ash!!!! This is so beautiful! I love it! I've always been to intimidated to try making a quilt. Maybe I will join in the Quilt Along! Thanks for sharing! OH MY GOODNESS!!!! It turned out beautiful! I have been so excited to see the quilts you made for them since March, when you told me what you were doing for Mom's Day. You did such a wonderful job. I love the color's in this one. 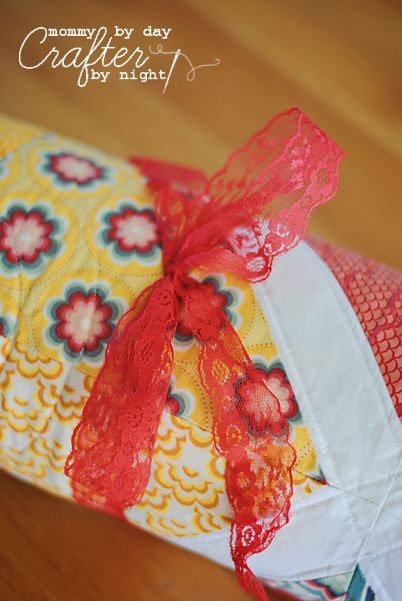 I love the quilt style! I know she must have just loved it! Can't wait to see the one you made your mom too! 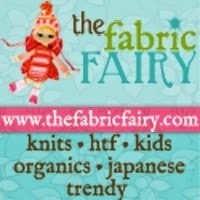 I am amazed how your sewing skills have just skyrocketed this last year. Amazing! Hope all went well on your travels back to Jeff!!! :) Love you! SO amazing! LOVE it! Love the colors and the design-- it really looks amazing! This is beautiful Ashley! I can't image sewing all those circles! But I think with quilts the hard work and not so perfect stitching makes it even more beautiful! I love how it turned out!! 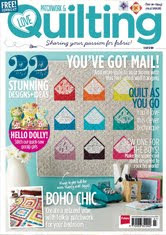 You are definitely inspiring me to make a quilt! 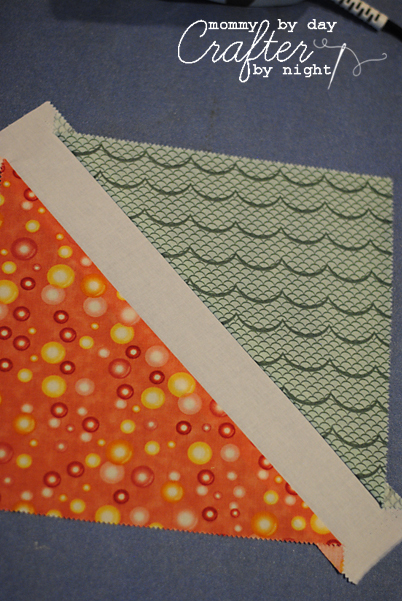 Although the fabric that I want to use for my boys room doesn't come out until September. 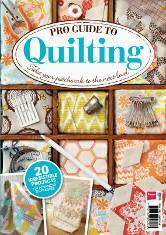 I guess I will have to keep myself busy with another quilt...I'm looking forward to your quilting series. Really lovely and I like your "make-do" approach! I am sure your m-i-l will treasure it. Seriously that is SO GORGEOUS! You are so talented! Nice and what a neat technique. Thanks for sharing! Beautiful quilt! 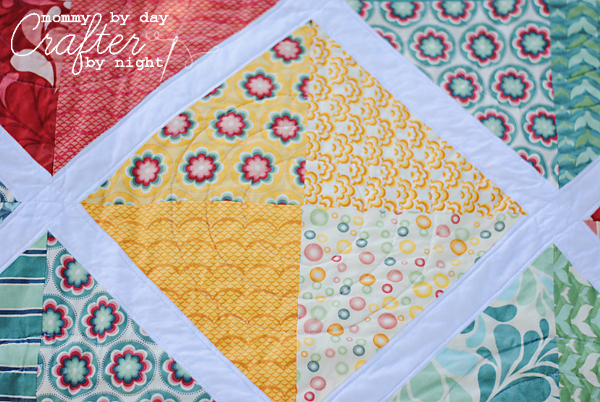 I think your method for quilting sounds like a great idea! Oh for goodness sake, this is the cutest quilt I've ever seen. 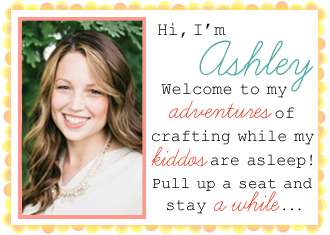 Ash, I can't wait to see the other quilt you made! I am beyond impressed. You have a beautiful talent Ashley and you are so incredibly thoughtful to share it with others. 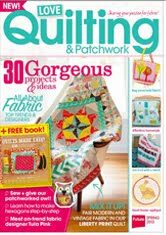 I can only imagine how much work all that quilting was! 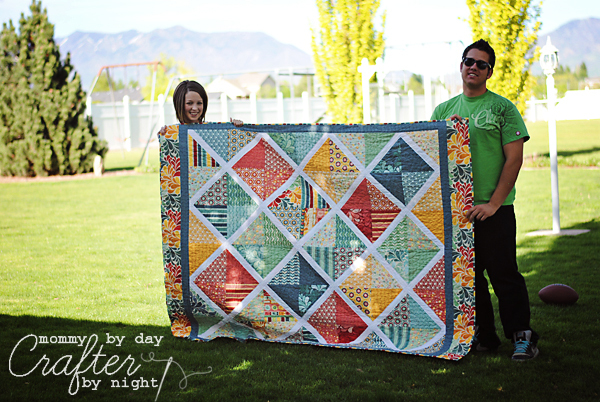 What a great quilt & special Mother's Day gift! Will you be posting the one you gave your mom? I really like Moda's Salt Air & might have to rethink not buying it. I guess a trip to the quilt shop is in order. Thanks for sharing. Beautiful quilt, I love the colors! I think I will have to make this one, looks like it will be easy and fast! Thanks for sharing it, what a lovely gift. 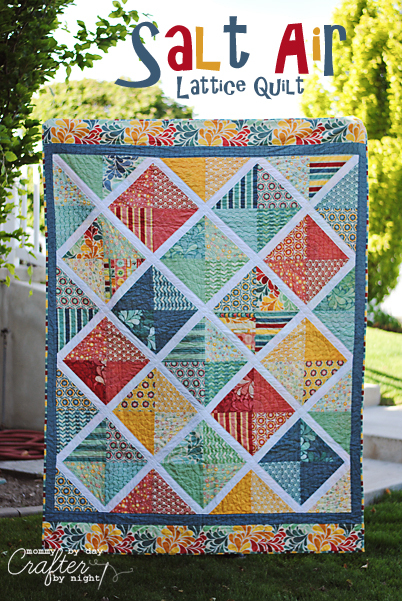 What a beautiful, bright and cheery quilt. It has a very modern and fun feel to it. I love your choice of fabrics. Beautifully done! I love this! I use my regular presser foot when quilting all the time. I'm just too lazy to try something new, I guess. I think your quilting looks great! WAY cute!!! I thought I was on Moda Bake shop when this popped up in my google reader. Thanks for sharing!!! That is beautiful! 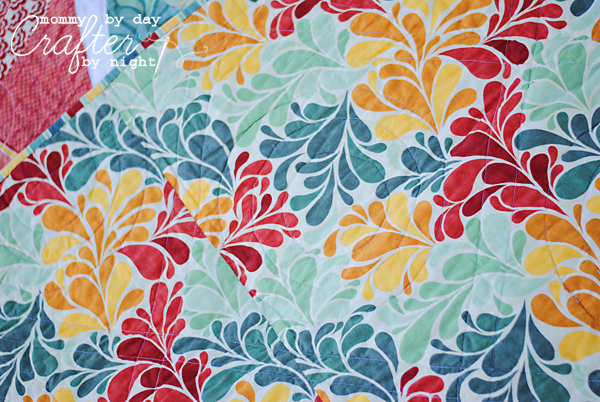 How would I figure out a king size quilt? I think this would look amazing on a bed!!! I've just found your pattern, and have ordered the fabrics. Can't wait to put it together!! Thank you for sharing your talent with us! Hi! When you pieced yours did you have any problems with the 15in. strips. They don't seem long enough to square the corners. I love it! 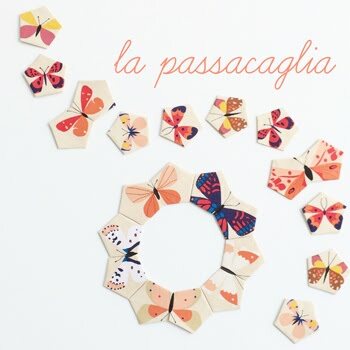 I've been looking for a very similar pattern to make a quilt for my daughter in law, but after seeing yours i want to make it! Thanks so much for sharing! I did a quilt with a regular pressure foot too, swore to never do that again until a good friend of mine told me about the walking foot......You will need to get you one, they are wonderful for sewing through layers. Looks great! Really like the pattern and your choice of fabric! great job!